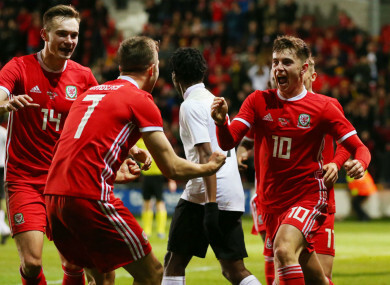 WALES GOT THEIR 2019 off to a winning start as Ben Woodburn’s stoppage-time goal claimed an unconvincing 1-0 friendly victory over Trinidad and Tobago at the Racecourse Ground. And though their absence was felt as Wales’ inexperienced line-up toiled for much of Wednesday’s clash in Wrexham, Liverpool forward Woodburn was on hand to bundle home in the 92nd minute. Things could have been different if not for Chris Gunter’s goal-line block at the other end, but Wales will be buoyed ahead of their opening Euro 2020 qualifier against Slovakia. George Thomas went close to making Wales’ dominance count when he dragged an effort just wide on the stroke of half-time, and the 21-year-old forced a fine save out of Phillip 11 minutes after the restart. Wales were almost caught cold soon after, though – Gunter reacting sharply to clear Aubrey David’s strike off the line. The offside flag denied Thomas a maiden Wales goal with 24 minutes remaining, but the deadlock was finally broken when Will Vaulks’ looped cross found its way to Woodburn, who chested the ball in from point-blank range. Email “92nd-minute winner spares Wales' blushes as they're pushed all the way by Trinidad and Tobago”. Feedback on “92nd-minute winner spares Wales' blushes as they're pushed all the way by Trinidad and Tobago”.